Stammen is the career strikeout leader for the University of Dayton, where he pitched for three years. 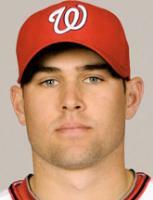 In 2007, the Baseball America Prospect Handbook rated Stammen as the 21st-best prospect in the Nationals' organization. Craig didn't make the book in 2008. But in the spring of 2009, he was at #20 in the Washington farm system. Stammen loves baseball. And the pro experience is something he truly enjoys. Stammen doesn't have to think twice about who gets the credit for his success on and off the baseball field. His father, Jeff, was the one who encouraged and taught him how to play baseball. "He always had fun just playing with me," Craig said. "Those are just good memories of us having our good times together. He really taught me how to play baseball from the very beginning. He is not one of those guys who knows the ins and outs of baseball. He played it and he knew that if you work hard and practice, you will become good." Craig followed his father's lead. He worked and practiced hard to get to the big leagues. He is now a workhorse in the Nationals' bullpen. Last year he was an invaluable piece in leading Washington to its first National League East title. Things are no different this year. Imagine how Jeff feels about having a son in the big leagues. "My Dad was a very good role model for me my whole entire life," Craig said about Jeff, who owned a hardware store in Ohio during Craig's formative years. "He is one of my best friends. I can count on him in any situation that I need. He is my rock to lean on. We have a very close relationship. "Whether I played one day in the Major Leagues or a million days, he is very proud of me. He enjoys watching me play in the big leagues just as much as I am. That's probably the coolest part about playing in the Major Leagues—you enjoy it with your family. My Dad tries to come to as many games as he can because he enjoys them so much." In the middle of the 2010 season, Craig needed to lean on Jeff when the Nationals sent Craig down to Triple-A Syracuse. There was Jeff encouraging his son to do better and work his way back to the Majors. During that period, Craig always had flashbacks of working hard with his father at the hardware store. It also helped that Jeff never tore him town. He was always building him up. "His best quality is he will tell you how you are supposed to do it," Craig said about Jeff. "He can correct you, reprimand you and stuff, but he is always encouraging you to do better and be the best that you can be.… He told me to continue to work hard. He talked about doing your job, keeping your head down, not really looking what's ahead of you, but worry about what's going on right now. Craig was raised in North Star, Ohio, which hosts a population of slightly more than 200. Stammen is a bit overshadowed in his hometown. Renowned gunslinger Annie Oakley was born in the area in 1860. Just before the lineup of vibrant red and blue tractors and plows outside of North Star Hardware stands signage commemorating Oakley and welcoming travelers to the tiny town. Stammen went on to say that his moves are “a little rusty,” but scored himself an 8 out of 10. And there’s no need to worry about his lady friend. Craig Stammen is a Catholic. He spoke of his faith in a 2013 interview with the National Catholic Register. While the mechanics of baseball are a part of everyone’s preparation, Stammen has an added benefit coming into the season: his practice of trusting in God’s providence. The North Star, Ohio, resident learned to entrust everything to God several years ago at the University of Dayton. After a summer of rookie league baseball in 2005, Stammen returned to campus for the fall semester. It was during this time that he first shared his Catholic faith publicly—a turning point that helped to solidify his core beliefs and aim in life. "I take pride in taking care of my body and being able to pitch every day," said Stammen. "I've been lucky to have a pretty resilient arm. It is a point of pride for me. I like being the workhorse, the bulldog. I think those are good qualities to have in the bullpen." During the 2013 off-season, before 2014 spring training, Craig finished his college degree. Since he was drafted by the Nationals in 2005, Stammen had wanted to finish the final 15 credits needed to earn his entrepreneurship degree at the University of Dayton. His mother, Connie, a teacher, stressed the importance of completing his education after he left college following his junior season to chase his dream of pitching in the Major Leagues. May 3, 2014: Stammen received his bachelor's degree from the University of Dayton, but he was not able to attend because he was be with the Nationals, who are played the Phillies at Citizens Bank Park that afternoon. Stammen majored in entrepreneurship and he hopes to put that degree into good use after his playing career is over. He had thoughts of working for his father, who sells farm equipment in Ohio. But baseball made him take a different direction. 2014 Off-Season: Craig worked out in his hometown in Ohio and playing golf around the country. He has also worked at his father's business selling farm equipment. January, 2017: Craig videoed his new wife, Audrey, hitting a hole-in-one when they were playing golf on their honeymoon, in Hawaii. On April 14, 2015, in Boston, Craig exited his outing with a torn flexor muscle in his pitching arm. He missed the remainder of the season. And he didn't pitch in the Majors in 2016. "I set a goal, from the day I got injured, that I wanted to pitch again in the Major Leagues—but more specifically on that mound," said Stammen, referring to Nationals Park. "Once I was gone to free agency and other teams, I wanted to pitch back here. I guess it was a goal reached yesterday. Time to set some loftier ones." Stammen said he earned himself "a lot of bragging rights" with two clean frames against some of his best friends. "It's fun to see a lot of people I built a lot of good relationships with, say hi, thank them for my time when I was here," Stammen said. "It was also fun to pitch in this park. I feel pretty comfortable on that mound." After a rough start with the Padres, Stammen has settled into a groove. He's been arguably their most effective reliever in May 2017. Stammen effectively found his groove pitching mop-up duty, after his ERA ballooned past 10 on April 25, 2017. On six different occasions that month, he helped preserve the bullpen with at least two innings when the Padres found themselves behind. Stammen called his recent run of appearances "a blessing in disguise, having to pitch in some of those blowout games." In the process, he's reverted back to his old mechanics and begun to more closely resemble the pitcher he was during his time in D.C.
"On the pursuit of perfect mechanics to protect my elbow, I lost deception and what I was good at," Stammen said. "I've always been able to throw strikes; it's been about whether the hitters can see me good or not. I'm a little goofy, so I needed to keep my goofiness, my herky-jerky motion. That's part of who I am and why I've had success. I just needed to embrace it and not try to be Mariano Rivera." Stammen began his career as an ineffective starter before transitioning to the bullpen in 2010. After his move to a relief role, he posted a 3.02 ERA in 280 innings. He played a part in two Nationals division titles along the way. Few things can be more stressful for a relief pitcher than walking into a bases-loaded situation. But Craig says he welcomes the opportunity. Actually, opportunities. For the seventh time in 2017, Stammen entered a Padres game with the bases loaded. And that marked the sixth time he walked off the mound with none of the three runners having scored. The one time it didn't happen was due to an error. "It's one of the best feelings in baseball when you're walking off the field after getting out of one of those jams," Stammen said. "It's a privilege to be called to step into that situation. The best thing going for me, I throw strikes." Stammen was summoned into that situation on August 30, 2017, when the Giants loaded the bases with one out against starter Travis Wood in the fifth. Stammen's effort became a key moment as the Padres went on to defeat the Giants 5-0 at Petco Park. First, he struck out Hunter Pence for the second out of the inning. Then he retired Pablo Sandoval on a fly out to center. "Stammen has done it time and time again," said Padres manager Andy Green. "It's great to have a weapon like that." Craig enjoyed his first Father's Day as a dad in June 2018. His first child, Chase, was born March 20. June 2005: The Nationals chose Stammen in the 12th round, out of the University of Dayton. He signed with scout Ben Jones. January 18, 2013: Stammen and the Nationals agreed on a two-year, $2.25 million contract, through the 2014 season. January 16, 2015: The Nationals and Craig avoided arbitration, agreeing to a $2.25 million contract for 2015. December 2, 2015: Craig elected free agency. February 8, 2016: The Indians signed free agent Stammen. December, 2016: Stammen signed a minor league contract with the San Diego Padres. Nov 2, 2017: Craig elected free agency. Stammen has a fair 87-94 mph four-seam FASTBALL that has a little bit of late life. His two-seam sinker has decent movement. Craig's fine SLIDER is his best pitch. He can throw it for strikes or get hitters to chase it into the dirt. His 77-78 mph CHANGEUP is pretty good, and he throws it with decent arm speed. Craig's sinker is underrated. His slider is really impressive, but he uses it off his fine two-seam sinker. 2018 Season Pitch Usage: 4-seam Fastball: 2.8% of the time; Sinker 64.8%; Change less than 1%; Slider 20.7%; and Curve 11% of the time. Average velocity: 4-seam 92.2 mph, Sinker 92.4, Change 89.3, Slider 87.5, and Curve 81.5 mph. During the first half of the 2009 season, Syracuse (IL-Nationals) pitching coach Steve McCatty helped tweak Craig's delivery. Stammen's arm angle is farther from his head than before, which has improved the effectiveness of his sinker. Stammen has learned to trust his stuff. Craig's 170 innings pitched over the 2012 and 2013 seasons are the most for any Major League pitcher who did not start a game. In his rookie year, Stammen relied heavily on a four-seam fastball, with a curveball as his primary breaking pitch. In 2014, he went after hitters primarily with a sinker and slider, with the curve as a third pitch. According to manager Matt Williams, Stammen's ability to throw any of those for a strike and generate quick outs with the sinker allows him to "roll through innings pretty quick." As of the start of the 2019 season, Craig has a career record of 36-30 with 3.67 ERA, having allowed 58 home runs and 627 hits in 650 innings in the Major Leagues. 2007: Stammen pitched with a knee injury down the stretch, then had surgery to clean out the area after the season. September 4, 2009: Craig missed his start with the Nationals because of elbow soreness. An MRI was taken. And on September 6, Stammen underwent arthroscopic surgery to remove a bone spur in the back of his right elbow. Team orthopedist Wiemi Douoguih performed the procedure. April 15, 2015: Stammen was on the D.L. with right forearm stiffness. April 16-end of 2015 season: An MRI revealed Craig had a torn flexor tendon in his right forearm. Surgery was required and he missed the rest of the season. March-July 7, 2016: Stammen was still recovering from the elbow surgery from the year before.